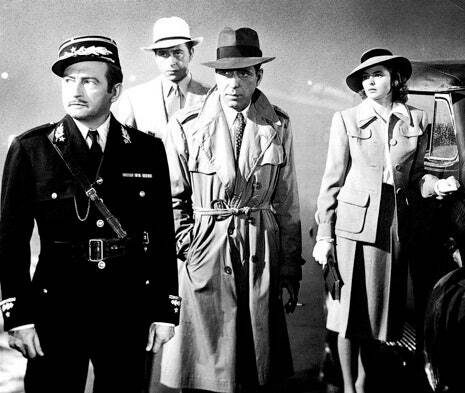 To me, “Casablanca” is the truest classic movie ever made. How can it not be? I agree with the marvel part. Many don't fit into the last 30 years part. Even The Godfather (#6), is more than 45 years old. The first 21 century film is David Lynch's Mulholland Dr. (#61). Many don't fit into the last 30 years part. Even The Godfather (#6), is more than 45 years old. Ah, thanks for that. Scanning the first 100, I've seen 12 of them for sure, vaguely recall one more, haven't even heard of over half of them. I finally watched The Big Lebowski just a few months ago and thought it was great. I've never seen a Star Wars movie, or Avatar, or ET...it can be a pretty long list actually. I haven't seen Finding Nemo. Or Dory. I know a lot of people rave about Pixar, but call me when they produce something akin to Catshit One. I'd settle for an adaptation of Watership Down, complete with gore. I have to confess. I saw Tombstone for the first time last month (and it was excellent). Another thought: As others have said, too many modern movies are absolute crap. Whereas, good movies (e.g., Godfather I & II, Double Indemnity, Chinatown, Rear Window, etc) are worth multiple screenings. Why waste time watching some utterly forgettable movie when you could enjoy a classic - even if you've seen it before? Because you don’t know it’s utter crap to you until you watch (at least part of) it? Only seen one the past 30 years, Wonder, it was pretty good. Also one of my favorite Bogie movie, The Maltese Falcon. "It's the stuff dreams are made of". I used to really enjoy Siskel's and Ebert's reviews. But, these days I don't know of anyone who can match the quality of their work. Undoubtedly a lot of movies that I should see, but haven’t. I’m a bit baffled by some of the movies listed. It happens that I have seen the movie Avatar, but I didn’t see anything noteworthy about it. Not worth mentioning if you haven’t seen it. An Inconvenient Truth?!? those that listed it are just jackin’ with us...right? My wife and I have embarked on the effort to watch all of the Westerns and Cowboy movies of the 1930s and 1940s. They were once very popular and known to the Greatest Generation (which is now almost passed). Movies starring Tom Mix, William Boyd, William S Hart, Hoot Gibson, Harry Carey, Gene Autry, Buck Jones, Bill Cody, Tex Bell, Tex Ritter, etc. We have started out with a collection of 50 movies, and we watch a couple every night. For some reason, I have never seen The Blues Brothers nor Ghostbusters. I haven't made much of an effort to see current movies for quite some time. Formulaic dreck for the most part. Was dragged to one of the Transformers movies. No, I don't know which one Is there any way to tell? Ten minutes of one of the Fast and Furious franchise was enough for me. Give me the classics. I've been able to collect pretty much every Bogart film that's available. And my noir collection has grown massively. Lots, especially those made in the past couple of decades. It would be much easier for me to list the films that I actually HAVE watched. Last Best Picture film I've sat down and completely watched was Return of the King from the LOTR trilogy, and then only after it came to DVD. I liked it, but then I was a sucker for sci-fi/fantasy stuff for a while back then. Several years ago I started watching a borrowed DVD of The Hurt Locker but never could get beyond the first 15 minutes or so before distracting myself with other things. Since returned, probably will never see it in its entirety. Those are probably the only two BP winners that I can name that were made in the past two decades. As for Golden Age films, I've never watched more than bits and pieces of Citizen Kane, Gone With The Wind and The Maltese Falcon, among many other classics. Dr. Strangelove is another notable that I never watched completely in a single sitting, though I think by now I've probably seen the entire film in a jigsaw puzzle kind of sequence. A lot of Hitchcock films were the same. Even a few the 007 films were that uninteresting for me, and a few that I DID actually watch I ended up regretting the time wasted in doing so. Pretty much anything that won an Oscar for Best Picture in the last 20 years. ETA: I have seen No Country For Old Men and The Hurt Locker. Enjoyed NCFOM. Lone Survivor. I keep avoiding it. Maybe because I know it will make sad but also so G#$damn angry, I'll want to club baby seals. plenty of movies I don't see but there's plenty of great films made today, as well. Looking at best pictures and those nominated for the award since 2000, I've seen a bunch. Of the 126 films nominated for BP since 2000, I've seen 61 (kinda surprised.) The pct% probably goes up if you go back to 1990. Many of them I thought were great. Only a few did I not like at all. I've seen 13 of the 18 winners. Many of them I liked a different nominee more.